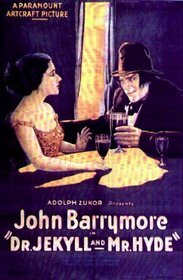 Of the countless cinematic adaptations of Robert Louis Stevenson's novella "The Strange Case of Dr. Jekyll and Mr. Hyde", the most effective to this day is Paramount's 1920 version starring "the Great Profile", John Barrymore, in the title roles. Under the direction of John S. Robertson, and with the stunning performance of Barrymore, the film dips deep into the well of depravity that is Hyde, creating a thoroughly engaging experience. Barrymore's Hyde is perfection. His grotesque appearance, aided by makeup but mostly by the effort of Barrymore's only physical contortions, suggests a man whose soul has rotted off the vine. His whole body is sunken inward, as if ravaged, disease-ridden, by the character's malevolence. His appearance only becomes more rotted and malignant as the film continues, suggesting that the disease metaphor may be very apt indeed. At one point, three-quarters of the way through the movie, Jekyll transforms into Hyde on-camera (using a simple dissolve technique) and the difference between the two characters is so complete that it seems impossible that they are played by the same actor. Beyond mere apperances, Barrymore seems to be indulging his personal Hyde throughout the performance -- such is the vigor and even glee with which he attacks his scenes. Barrymore is more sedate as Jekyll -- he would have to be, wouldn't he? At the beginning of the film, the "good half" is portrayed as just that -- an abstract of virtue against which Hyde's evil deeds can be compared. As Hyde's hold grows Jekyll begins to take on a personality, albeit one that is haunted and little else. Then, something curious happens. In the very last act of the film, when Jekyll holes up in his lab for the protection of his friends and loved ones, we see a real character. Jekyll's eyes are darker, his hair wilder, and his actions frantic -- in his desperation to fight off the evil of Hyde, he has taken on an aspect of the evil he would seek to conquer. At that point, we believe in the reality of Jekyll as opposed to the idea of him -- just in time for a finale which requires an actual sympathetic character to work properly. There are those that say that the American horror film didn't really exist until Universal's Dracula (1931) and that all so-called "horror" movies from the silent era were Gothic melodramas. I would disagree, however, and point out Barrymore's Dr. Jekyll and Mr. Hyde as an effective argument against that notion. Hyde isn't a tragic figure, even if Jekyll is. Hyde loves being evil. His sole reason for existence is evil. This version of the tale even includes the brutal child-stamping scene from Stevenson's novella, something omitted from almost every other version made before or since. Conversely, Jekyll is a man who meddles in "God's domain" for the wrong reasons (to absolve himself of responsibility for sin, rather than to better humanity) and receives his just punishment for his actions. Supernatural morality tales are the stuff from which horror was birthed. If this film isn't horror, then we need to radically reconsider the genre from the ground up. Dr. Jekyll and Mr. Hyde is not without a few flaws, although the most significant of them might be attributed to the film's age and the resulting scarcity (or perhaps non-existence) of truly complete prints. Namely, the editing occasionally comes off as choppy, especially in a sequence where Hyde's paramour Gina (Nita Naldi) describes the history of a very special ring. We see flashbacks to the medieval period from which the ring originated, but they appear in incomplete scraps. I definitely had the impression that footage was missing. If this is the case, we may as well consider the proper version of the flashback as lost -- the Kino DVD that I used to review the film is considered to be the most complete version of the film currently known. Another issue, one that rests squarely with the film itself, is the static direction. Although some staginess is to be expected as standard for all but the very best silent films, the camerawork in Dr. Jekyll and Mr. Hyde lacks variety. Director John S. Robertson shoots each scene straight-on from the "fourth wall", rarely angling his camera to give the sets a sense of real depth or perspective. The edges of each frame might as well form a proscenium. Still, there are a few effective sequences -- the aforementioned child-stamping, for instance, and the chilling scene where a troubled Jekyll dreams of being consumed by a giant spider with Hyde's face. Many fine actors have given their all to the dual role of Henry Jekyll and Edward Hyde -- Fredric March, Spencer Tracy, and Michael Caine are the ones that come immediately to mind. However, there is no performance so rich in insiduous delights as the one John Barrymore gives in this film. With the most exquisite pantomime, Barrymore creates the perfect Hyde -- a scurrilous wretch, evil and decayed. That his creation exists in a flawed production is really of no consequence. Barrymore makes this film worth all of its missteps.